Honda showcased the 2019 updated version of the CBR650F at the EICMA show in Milan. They have now said adios to the suffix ‘F’ and have rebadged it as the CBR650R. Due to its subtle styling, the current CBR650F doesn’t attract too much attention and likes to stay in the shadows like the Dark Knight. Unfortunately for Honda, due to this, the competition managed to hog the headlines and dominate this segment. But things are going to change now as Honda has decided to throw the ‘sense and sensibility’ thought out of the window and has decided to bring in a leaner, more aggressive and a more powerful mid-weight sports tourer that will certainly attract a lot of attention. So, let’s find out what's the new 2019 CBR650R all about. This is the reason why Honda replaced the ‘F’ with the ‘R’. Unlike the 650F, which can easily get lost in the crowd, the R version stands out with its sharp styling, which adds a much-needed attitude that this mild-mannered gentleman lacks. Based on the aggressive lines of the CBR1000RR Fireblade, this styling DNA is quite evident around the upper front fairing and the extended lower fairing. 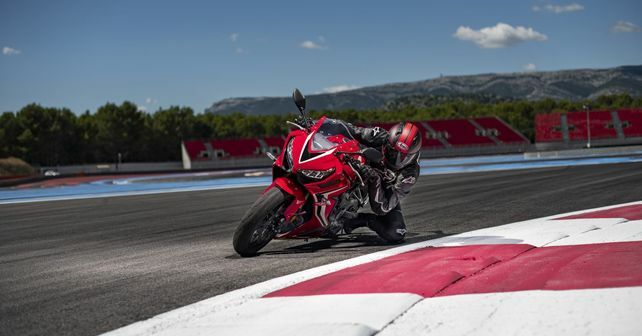 The new 650R does not only look sporty, but it also has a more aggressive riding position. With the seat now more compact, the clip-on handlebars are moved further forward by 30mm forward and are lower than the current CBR650F. The footpegs too are moved back by 3mm and are higher by 6mm. Seat height, on the other hand, remains at 810mm. The CBR650R continues to be powered by the refined 649cc four-cylinder DOHC 16-valve engine, but it now boasts of 94bhp of power output, making 8bhp more than the 86bhp CBR650F, thanks to a new intake, exhaust and an increased compression ratio to 11.6:1 from 11.4:1. Due to an increase in power delivery, the powerplant now revs up to 12,000rpm, 1000rpm higher than the CBR650F. Even the torque has now been bumped up to 64Nm from 60.5Nm. The new CBR650R comes fully loaded with new convenience and safety features. The new sports tourer comes with HSTC (Honda Selectable Torque Control) system, which is available in the Africa Twin. The system basically ensures that the rear wheel doesn’t lose traction as it controls the torque generated by the engine by controlling fuel injection. The amount of torque control can be selected in three steps, and the torque control system can also be disabled. Another new addition is the slipper clutch; which eases upshifts and manages rear-wheel lock up under rapid downshifts. The 650R weighs 207 kilogrammes and is lighter than the 216kgs current CBR650F thanks to a lighter chassis and the steel diamond frame and revisions to the fuel tank and the footpegs. Also new is 41mm Showa SFF USD fork and four-piston radial-mount Nissin front brake callipers, which work on 310mm floating discs. It also now boasts of new dual LED headlights and all digital LCD instrument display that includes a Gear Position and Shift-Up indicator. The CBR650R is the successor to the current CBR650F and should make its debut next year in India. As the CBR650F is assembled in India and is priced at Rs 7.3 lakhs, ex-showroom Delhi, therefore, the new 650R should follow the same route and will be slightly higher priced than the current generation.